Global manufacturing activity stagnated in May, pulled lower by continued weaknesses in the emerging markets and by softer-than-desired economic growth in the United States. The J.P. Morgan Global Manufacturing PMI edged down from 50.1 in April to 50.0 in May, its neutral point. Overall, this suggests that manufacturers continue to face significant headwinds to growth despite recent signs of progress. Exports and employment continued to contract in May, with new orders and output expanding ever so slightly. As noted in prior releases, U.S. manufacturing performance accounted for one-quarter of the weighting in the global index, with output contracting for the first time since September 2009, according to Markit. Interestingly, this reading contrasts with more favorable data from the Institute for Supply Management (ISM). The ISM Manufacturing PMI expanded for the third straight month, up from 50.8 to 51.3. Nonetheless, the most recent jobs numbers suggest that manufacturing’s challenges remain far from over, with cautious business leaders holding back on hiring, at least for now. The top 15 markets for U.S.-manufactured goods were equally divided in May, with seven nations expanding and seven contracting. (Belgium does not have a manufacturing PMI for comparison purposes.) That represented some progress from April, which had only five markets expanding. South Korea and the United Kingdom saw improvements in May, with both recording expansion just marginally above neutral and the latter brushing off worries about a possible “Brexit.” Voters in the United Kingdom will decide on June 23 whether or not to stay in the European Union. For its part, real GDP in the Eurozone also rebounded in the first quarter of 2016, up 0.6 percent following a 0.4 percent gain in the fourth quarter of 2015. Of the seven contracting markets, Brazil fared the worst in May, declining at its fastest pace since February 2009. This, of course, followed recent impeachment proceedings for President Dilma Rousseff. Meanwhile, manufacturing activity in China pulled lower once again in May, falling to a three-month low and contracting for the 15th straight month. We will get new data on industrial production, retail sales and fixed asset investment on June 12, but recent data reflected ongoing deceleration. For instance, industrial production expanded by 6.0 percent year-over-year in April, down from 6.8 percent in March, whereas two years ago, that figure hit 8.7 percent year-over-year. Fixed asset investment and retail sales followed a similar trend in April. In the first quarter of 2016, the Chinese economy grew 6.7 percent year-over-year, down from 6.8 percent in the fourth quarter. My forecast is for real GDP to expand 6.5 percent, using official estimates, in 2016. At the same time, emerging markets, which include China, continued to struggle. The Markit Emerging Markets Manufacturing Index remained unchanged at 49.5 in May, holding in negative territory for 13 of the past 14 months. On the positive side, Canada’s manufacturers report modest gains in activity outside of energy regions.The RBC Canadian Manufacturing PMI declined from 52.2 to 52.1, but even with a slight easing, this marks the third consecutive monthly expansion in manufacturing activity. April’s reading showed the fastest pace since December 2014, with May’s report not far from that level. As with prior releases, manufacturers in Alberta and British Columbia remained weak due to reduced energy prices, with other regions of Canada expanding at a more decent pace. The Canadian economy improved in the first quarter of 2016, growing 2.4 percent at the annual rate, up from 0.5 percent in the fourth quarter of 2015. Yet, manufacturing output and retail sales were softer than desired in March. Global headwinds have hampered the goal of increasing international demand. 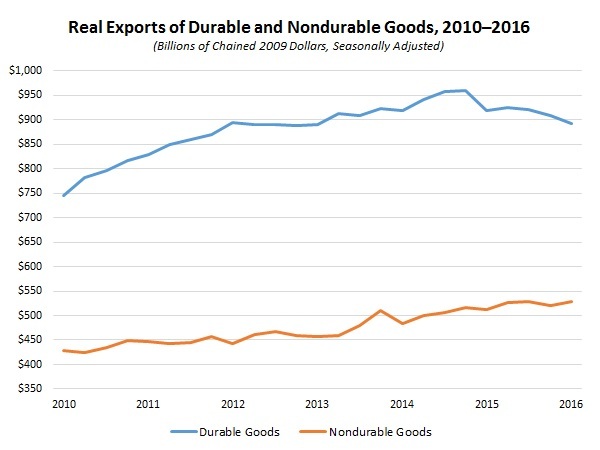 Using non-seasonally adjusted data, U.S.-manufactured goods exports totaled $342.72 billion year-to-date in April, down 7.5 percent from $370.51 billion in April 2015. Moreover, exports fell for the top four markets of U.S.-manufactured goods, including Canada, Mexico, China and Japan. Exports to the European Union were also off, even as the fifth-largest market, the United Kingdom, experienced slight growth. Overall, the U.S. trade deficit edged higher in April, with growth in goods imports outpacing the gain in goods exports. One bright spot in the data: the April petroleum deficit of $3.13 billion hit its lowest point since February 1999. The NAM strongly welcomed the enactment of a new Miscellaneous Tariff Bill (MTB) that will finally allow manufacturers to seek tariff relief for products not available in the United States. Work continues to intensify on action on the Trans-Pacific Partnership (TPP) and Senate consideration of the nominee to the Export-Import (Ex-Im) Bank board. Manufacturers also continued to promote strong outcomes in other negotiations and to address foreign barriers and other market distortion in India and China. Manufacturers celebrated World Trade Month with lots of activity and commentary in the face of continuing opposition to strong trade agreements and policies from major presidential candidates. Global manufacturing activity stagnated in May. The J.P. Morgan Global Manufacturing PMI edged down from 50.1 in April to 50.0 in May, its neutral point. This marks the second time in the past four months that the index has measured 50.0, or third, if you count April’s near-neutral reading. Overall, it suggests that manufacturers continue to face significant headwinds to growth despite recent signs of progress. Exports (down from 49.2 to 48.9) and employment (up from 49.4 to 49.7) continued to contract in May, with new orders (down from 50.3 to 50.2) and output (down from 50.4 to 50.1) expanding ever so slightly. As noted in prior releases, the United States (down from 50.8 to 50.7) accounted for one-quarter of the weighting in the global index, with output contracting for the first time since September 2009. Interestingly, this reading contrasts with more favorable data from the ISM. The ISM Manufacturing PMI expanded for the third straight month, up from 50.8 to 51.3. In addition to the United States, China (down from 49.4 to 49.2) and Japan (down from 48.2 to 47.7) represented another 17.3 percent of the weighting for the global index, and both of those nations contracted further for the month. Manufacturing activity in Japan declined at its fastest rate since January 2013. The top 15 markets for U.S.-manufactured goods were equally divided in May, with seven nations expanding and seven contracting. (Belgium does not have a manufacturing PMI for comparison purposes.) That represented some progress from April, which had only five markets expanding. South Korea (up from 50.0 to 50.1) and the United Kingdom (up from 49.4 to 50.1) saw improvements in May, with both recording expansion just marginally above neutral and the latter brushing off worries about a possible “Brexit.” Voters in the United Kingdom will decide on June 23 whether or not to stay in the European Union. Of the seven contracting markets, Brazil fared the worst in May (down from 42.6 to 41.6), its sharpest decline since February 2009. This, of course, followed recent impeachment proceedings for President Dilma Rousseff. Canada’s manufacturers report modest gains in activity outside of energy regions. The RBC Canadian Manufacturing PMI declined from 52.2 to 52.1, but even with a slight easing, this marks the third consecutive monthly expansion in manufacturing activity. April’s reading showed the fastest pace since December 2014, with May’s report not far from that level. The underlying data were mixed, but remained mostly positive. Output (up from 52.1 to 52.8) accelerated for the month, but other measures slowed a bit, including new orders (down from 52.4 to 51.9) and hiring (down from 52.4 to 52.2). The one area of weakness was exports (down from 51.0 to 49.1), which contracted for the first time in seven months. As in prior months, manufacturers in Alberta and British Columbia (up from 45.2 to 45.7) continued to struggle, with other regions of Canada expanding at a more decent pace. Despite some recent progress, real GDP fell 0.2 percent in March, extending the 0.1 percent loss in February. Manufacturing output was also off 0.2 percent in March, largely from transportation equipment. Retail sales weakened as well, down 1.0 percent in March, but on a year-over-year basis, spending has been one of the brighter spots, up 3.2 percent since March 2015. Nonetheless, the Canadian economy improved in the first quarter of 2016, growing 2.4 percent at the annual rate, up from 0.5 percent in the fourth quarter of 2015. Mexican manufacturing picked up somewhat in May, but remained weaker than desired. The Markit Mexico Manufacturing PMI increased from 52.4 to 53.6, its strongest pace since April 2014. New orders (up from 54.3 to 56.0), output (up from 51.4 to 53.8) and exports (up from 52.1 to 52.5) each accelerated for the month, with employment (down from 52.5 to 51.9) pulling back slightly but continuing to expand. Nonetheless, manufacturing production declined 1.5 percent in March following a 3.9 percent gain in February. We hope that new output data for April, out on June 10, reflect the more recent progress observed in sentiment surveys. Overall, real GDP increased 2.6 percent year-over-year in the first quarter, up from 2.4 percent in the fourth quarter of 2015. Growth in Mexico is expected to remain around 2.5 percent in 2016; however, it is predicted to pick up to 3.0 percent in 2017. Manufacturing activity in China pulled lower once again in May. The Caixin China General Manufacturing PMI decreased from 49.4 to 49.2, its lowest level since February and its 15th straight monthly contraction. New orders (down from 50.0 to 49.7) returned to negative territory in May following two months of stabilization, and output (down from 49.9 to 49.8) and exports (down from 48.6 to 47.7) both declined at a faster rate. Hiring (up from 46.1 to 46.3) has now contracted in every month since October 2013. Despite the pullback in activity in the Caixin data, the official manufacturing PMI from the National Bureau of Statistics of China remained unchanged at 50.1, expanding ever so slightly for the third consecutive month. With that said, the government also noted continuing contractions in May for small enterprises. We will get new data on industrial production, retail sales and fixed asset investment on June 12. Recent data have reflected decelerating activity, with industrial production expanding 6.0 percent year-over-year in April, down from 6.8 percent in March. Two years ago, production in the sector grew 8.7 percent year-over-year. Fixed asset investment (down from 10.7 percent year-over-year to 10.5 percent) and retail sales (down from 10.5 percent to 10.1 percent) followed a similar trend in April. In the first quarter of 2016, the Chinese economy grew 6.7 percent year-over-year, down from 6.8 percent in the fourth quarter. My forecast is for real GDP to expand 6.5 percent, using official estimates, in 2016. Eurozone manufacturing activity declined to a three-month low. The Markit Eurozone Manufacturing PMI decreased from 51.7 to 51.5, its lowest level since February. The good news is that activity continues to expand somewhat modestly, with the headline index averaging 51.7 year-to-date in 2016, even if there has been some deceleration from the 52.5 average pace in the second half of 2015. This suggests that global headwinds, the migrant crisis and worries about a possible “Brexit” have taken a toll on business sentiment, but fortunately, the continent continues to grow. In May, all key indicators eased, including new orders (down from 52.1 to 51.7), output (down from 52.6 to 52.4), exports (down from 51.5 to 50.9) and hiring (down from 51.6 to 51.2). The country-by-country data in April reflected mixed levels of growth for most major markets; however, France (up from 48.0 to 48.4) and Greece (down from 49.7 to 48.4) continue to contract. As noted earlier, the United Kingdom (up from 49.4 to 50.1) expanded marginally in May despite “Brexit” anxieties; yet, it is hard not to notice that sentiment has fallen dramatically of late, with the United Kingdom’s manufacturing PMI at 55.2 as recently as seven months ago. Austria (unchanged at 52.0), Ireland (down from 52.6 to 51.5), Italy (down from 53.9 to 52.4), the Netherlands (down from 52.7 to 52.6) and Spain (down from 53.5 to 51.8) have each slowed in recent months, with all but Austria easing once again in May. Germany (up from 51.8 to 52.1) fared better, with stronger hiring, new orders and production for the month. Real GDP in the Eurozone grew 0.6 percent in the first quarter of 2016, up from 0.4 percent in the fourth quarter of 2015. On a year-over-year basis, the Eurozone economy expanded 1.7 percent, but other data on recent activity in the Eurozone have been mixed. Industrial production declined 0.8 percent in March, extending the 1.2 percent decrease in February. On a year-over-year basis, industrial production grew just 0.2 percent, highlighting the challenges to the sector seen over the past 12 months. (April industrial production data will be released on June 14.) In addition, retail sales held steady in April, improving from the decline of 0.6 percent in March, with year-over-year growth of 1.4 percent. The unemployment rate remained 10.2 percent in April, the same pace seen in March and its lowest level since August 2011. Overall, the European Central Bank continues to worry about sluggish growth and deflation risks, with policymakers pushing additional stimulative measures to spur the Eurozone economy, including negative interest rates. Indeed, the annual inflation rate dipped to -0.1 percent in May, falling for the third time in the past four months. Emerging markets continued to struggle, contracting again in May. The Markit Emerging Markets Manufacturing Index remained unchanged at 49.5 in May. It has been in negative territory in 13 of the past 14 months, illustrating the challenges for manufacturers in these markets. Indices for new orders and output stagnated at 49.9, or just barely below the neutral threshold, with exports (down from 48.9 to 48.7) falling further in May. The pace of decline for hiring (up from 47.7 to 47.9) eased a bit for the month, but the employment measure has contracted in all but four months in the past three years. Despite the slowing activity in the current environment, the forward-looking composite index for future output indicates cautious optimism for the months ahead (down from 61.1 to 60.4). On the bright side, stronger new orders helped to lift manufacturers in India (up from 50.5 to 50.7), Poland (up from 51.0 to 52.1), South Korea (up from 50.0 to 50.1) and Vietnam (up from 52.3 to 52.7), with new orders growing in the latter at the fastest rate in 12 months. At the same time, activity eased, but continued to expand, in both the Czech Republic (down from 53.6 to 53.3) and Indonesia (down from 50.9 to 50.6). South African manufacturing activity (up from 47.9 to 50.2) expanded for the first time since May 2015, with stronger domestic sales and exports. Meanwhile, a number of emerging market nations have contracted for more than a year. This trend continued in May, including Brazil (down from 42.6 to 41.6), China (down from 49.4 to 49.2), Hong Kong (down from 47.2 to 45.3), Russia (up from 48.0 to 49.6) and Taiwan (down from 49.7 to 49.5). Overall, the data suggest that the international trade headwinds seen last year have continued. Using non-seasonally adjusted data, U.S.-manufactured goods exports totaled $342.72 billion year-to-date in April, down 7.5 percent from $370.51 billion in April 2015. Moreover, exports fell for the top four markets of U.S.-manufactured goods, including Canada (down from $94.28 billion to $87.00 billion), Mexico (down from $77.04 billion to $75.02 billion), China (down from $37.43 billion to $33.88 billion) and Japan (down from $21.49 billion to $19.75 billion). Exports to the European Union were also off, down from $92.09 billion to $90.72 billion, despite slight growth to the fifth-largest market, the United Kingdom (up from $17.66 billion to $18.40 billion). The U.S. trade deficit edged higher in April. The trade deficit rose from $35.54 billion in March to $37.44 billion in April. The increase stemmed from a growth in goods imports (up from $174.62 billion to $178.87 billion) that was enough to offset the gain in goods exports (up from $117.18 billion to $120.06 billion). Even with the pickup, it is worth noting that goods exports and imports have each declined across the past year, down from $128.97 billion and $192.13 billion in April 2015, respectively. That suggests that trade volumes have fallen overall, although part of that reduction could be lower petroleum prices. Indeed, the April petroleum deficit of $3.13 billion marks its lowest since February 1999. Digging deeper into the data, goods exports expanded across the board in April. This included growth in exports for industrial supplies and materials (up $1.79 billion), automotive vehicles and parts (up $839 million), foods, feeds and beverages (up $420 million), consumer goods (up $188 million) and capital goods (up $109 million). The downside was that goods imports also rose in each category. Goods imports rose for capital goods (up $2.51 billion), industrial supplies and materials (up $1.13 billion), consumer goods (up $509 million), automotive vehicles and parts (up $498 million) and foods, feeds and beverages (up $222 million). HPresident Obama signs legislation reforming the MTB process. On May 20, President Obama signed into law the American Manufacturing Competitiveness Act of 2016 (H.R. 4923), bipartisan legislation that creates a transparent, objective, predictable and regularized process for the consideration and enactment by Congress of the MTB. The MTB will eliminate tariffs on inputs and other products not produced or available in the United States. The NAM is working with Congress and the International Trade Commission (ITC) to determine detailed next steps and will be providing that information through its MTB Task Force. To participate in that task force or for more information on the MTB, contact NAM Director of International Trade Policy Ken Monahan. Broad NAM trade education efforts continue. Trade has been a hot topic for presidential candidates and political commentators throughout this year’s campaign. Unfortunately, the facts have often been overlooked. With May designated as World Trade Month, the NAM seized the opportunity to set the record straight on the benefits of trade: the ability to sell to customers around the world is essential to strengthening manufacturing in the United States, as is ensuring the global competitiveness of our manufacturers and that the rules of trade are fully and promptly enforced. Our efforts madenews.“Manufacturers take aim at presidential candidates’ anti-trade rhetoric,”reported Global Trade Magazine. The Hill, an influential D.C. publication, similarly heralded, “Manufacturers push back against anti-trade rhetoric by presidential candidates.”The NAM will continue topush a robust trade agenda that helps manufacturers grow and be more competitive. To participate in the NAM’s upcoming trade education activities, please contact NAM Vice President of International Economic Affairs Linda Dempsey. NAM works to move forward the TPP. Discussions between the Obama administration and the Senate Finance and House Ways and Means committee members to seek to resolve outstanding issues continue, as the industry expands efforts to educate members and the broader public on the importance of moving forward on the TPP. Last week, the administration indicated it had made progress on one issue related to the movement of financial data across borders. The TPP Coalition issued this statement on that progress, as the industry seeks to review the details. On May 18, the ITC issued its statutorily mandated report examining the economic impact of the TPP on the U.S. economy, and the NAM released a blog explaining that the “ITC report barely scratches the surface of the TPP’s impact” given its modeling assumptions and limited ability to examine much quantitatively beyond tariffs. The NAM is working with the U.S. Coalition for TPP and its membership on broad outreach activities and will continue to work with leaders on Capitol Hill and in the administration in the coming weeks and months to build support for the agreement, push back on critics of strong enforcement and address some of the agreement’s shortcomings. During the NAM’s Manufacturing Summit this week in Washington, D.C., manufacturers advocated the TPP during meetings on Capitol Hill. The NAM is leading a coalition effort to get companies and associations across the country and across all industries to sign onto letters urging their respective congressional delegations to pass the TPP as soon as possible. The first tranche of 10 state letters was sent to congressional delegations in California (180 signatories), Florida (118), Georgia (119), Illinois (230), New York (107), Oregon (102), South Carolina (111), Texas (132), Virginia (105) and Washington (106). The other 40 letters will follow in the coming months. The NAM also revamped its website to include a TPP-specific landing page with resources and important information to provide easy access for NAM members and the public to learn more about the TPP. To join the NAM’s TPP Task Force or for more information on the NAM’s advocacy efforts on the TPP, contact NAM Director of International Trade Policy Ken Monahan. Manufacturers intensify calls to Senate to act on Ex-Im Bank board nominee to ensure manufacturers’ competitiveness. The U.S. Ex-Im Bank remains closed for certain transactions, undermining the ability of U.S. exporters and their supply chains to compete and win in a fierce global economy. A new one-page summary of the issue notes that the agency’s board needs at least one more director to have the quorum required to review and approve transactions that exceed $10 million—the kind of major export transactions that benefit thousands of American exporters and suppliers. Over the Memorial Day recess and at the Manufacturing Summit this week, NAM members reached out to senators to highlight the importance of this issue to local jobs. Visit www.nam.org/exim to learn more or www.exportersforexim.org to contact your senator. To learn more about the NAM’s advocacy efforts on this issue, contact NAM Director of Trade Facilitation Policy Lauren Wilk. Transatlantic Trade and Investment Partnership (TTIP) talks continue in April. The 14th round of U.S.–EU TTIP talks is expected to take place in July, where the United States and European Union will seek to consolidate as much text as possible and continue to move forward each of the various chapter negotiations. For more information on the NAM’s TTIP advocacy efforts, contact NAM Director of International Trade Policy Ken Monahan. The NAM pushes back on UN overreach that threatens U.S. innovation and manufacturing. In November 2015, the Secretary General of the United Nations set up the United Nations High-Level Panel on Access to Medicines (UNHLP) to address the “policy incoherence” between health, intellectual property, human rights and trade. The panel could issue its final report soon. The NAM has also been engaged directly and with other industry partners on these issues since the establishment of the panel, filing formal comments with the UNHLP in February and raising this concern through meetings and letters to U.S. officials. In recent weeks, however, the NAM has stepped up its advocacy on both issues. In a May 21 Washington Examiner op-ed penned by NAM Vice President of International Economic Affairs Linda Dempsey, the NAM called on the UN to tackle the real issues impeding global access to badly needed medicines and not to “falsely brand IP protections—patents, for example—as a barrier to health care access.” The final timing for the release of any UNHLP report is not clear, and the NAM will continue to intensify its advocacy and its industry collaboration to push back on the proposed diminution of important intellectual property rights critical for innovation and strong U.S. manufacturing. For more information on these efforts, please contact NAM Director of International Business Policy Ryan Ong. Environmental Goods Agreement (EGA) negotiators to meet in June. The 14th round of EGA negotiations will take place the week of June 20 in Geneva, Switzerland. The NAM will lead a business delegation that week to Geneva, where discussions will continue on the products nominated for duty-free treatment by the United States and other countries as well as issues surrounding customs-related implementation. For more information on the NAM’s role as co-chair of the U.S. Coalition for Green Trade, contact NAM Director of International Trade Policy Ken Monahan. Investment openings, excess capacity highlight U.S.–China dialogue in Beijing. The United States and China on Tuesday completed two days of wide-ranging talks in Beijing as part of the Strategic and Economic Dialogue (S&ED). Among the top issues were a new Chinese commitment to move forward its long-awaited update on investment openings and active discussion on excess capacity issues affecting a range of global industries. In remarks made at the opening of the S&ED in Beijing, Chinese Vice Premier Wang Yang and U.S. Treasury Secretary Jacob Lew affirmed that China plans to submit a revised “negative list”—a list of sectors that would be carved out from investment openings under the Bilateral Investment Treaty (BIT)—when the two sides meet in Washington, D.C., next week for the next round of BIT negotiations. The dialogue’s economic fact sheet indicates considerable discussion on needed reforms to address excess capacity in China, a major global topic of concern at the recent G-7 meetings in Japan and a cross-industry NAM priority in a recent U.S. government submission on China issues. The American Iron and Steel Institute, an NAM member, emphasized the need for commitments on steel overcapacity to “lead to real results that produce a significant net reduction in excess steel capacity in China.” Other manufacturing-related commitments in this year’s dialogue include greater transparency surrounding implementation of the manufacturing-focused Made in China 2025 plan; commitments banning commercial purchase, sale or use of information technology products based on nationality; improvements to approvals of agricultural biotechnology products; and further work on best practices for export credits—though few of these commitments included concrete details. The S&ED is an annual dialogue hosted by the U.S. secretaries of treasury and state and the vice premier and state councillor of China’s State Council, with separate tracks to discuss strategic and economic issues. Indian Prime Minister Modi’s visit focuses on energy, security cooperation; little concrete progress on NAM commercial priorities. Indian Prime Minister Narendra Modi traveled to Washington this week for a visit highlighted by significant interaction with President Obama and other administration officials, Congress and business. According to White House fact sheets, energy and defense cooperation were the highlights of the visit, including commercial energy and nuclear deals, joint research and technology transfer, skills development and financing for both defense and energy. The two sides also agreed to broad cybersecurity principles that will be included in a joint framework within the next 60 days. On core commercial issues impacting manufacturers, the two sides recapped bilateral engagement and made broad commitments to explore ways to address barriers to trade in goods and services—a potential reference to India’s recent ratification of the Trade Facilitation Agreement—and further engagement on intellectual property. Concrete details on commercial issues, however, were disappointingly missing, though the broad discussion could set the table for progress at the upcoming Strategic & Commercial Dialogue, set to take place in late August in India. Congressional leaders had called for Prime Minister Modi to prioritize trade issues, and earlier this week, the NAM had encouraged both governments to build a stronger commercial relationship by making concrete progress on issues impacting manufacturers in both a Morning Consult op-ed and a new scorecard for the Modi regime in Politico. U.S. government seeks comments on import data requirements, publishes deadline for FDA-regulated imports. U.S. Customs and Border Protection announced last month a June 15 “mandatory use date” for electronic entry and entry summary filings in the Automated Commercial Environment for merchandise subject to Federal Drug Administration (FDA) import requirements. The Department of Energy also issued in May a Federal Register Notice re-opening the comment period—through June 15—on its proposal to require a certification of admissibility prior to importation for any covered product or equipment subject to an applicable energy conservation standard. The NAM previously submitted these comments. The NAM also submitted joint comments to the Census Bureau regarding a proposal to add a required import data element on used electronics. For more information, contact NAM Director of Trade Facilitation Policy Lauren Wilk. United States and Cuba hold Bilateral Commission meeting. In May, the United States and Cuba held the third Bilateral Commission in Havana, Cuba. The two sides will reportedly work to reach new agreements in fields like health, agriculture and the exchange of information in the meteorological and seismological sectors before they meet again in September. Intellectual property is also on the agenda for future discussions, including industrial property and the protection of trademarks and patents. The fourth meeting of the Bilateral Commission will be held in September 2016 in Washington. The U.S. Commerce Department continues to hold monthly conference calls for questions on exports and licensing, with the next one scheduled for June 14 at 2:00 p.m. To learn more about the NAM’s advocacy efforts on this issue, visit the NAM’s website or contact NAM Director of Trade Facilitation Policy Lauren Wilk. Gulf Cooperation Council (GCC) countries reportedly planning to implement new VAT. The GCC is reportedly planning to implement a broad-based 5 percent value-added tax (VAT) that would take effect January 1, 2018, and could increase prices and add administrative fees for U.S. exporters. If your company is concerned about the impact of the proposed new VAT on your business, please contact NAM Director of International Trade Policy Ken Monahan. The U.S. Commercial Service and the South Florida District Export Council for Discover Global will host a two-day conference designed to increase trade across the Western Hemisphere. Trade experts, economists, industry professionals and U.S. Commercial Service diplomats will participate in panels and executive meetings to discuss opportunities, challenges and winning strategies in the region. Participants will gain the necessary insight and knowledge to seek new business opportunities throughout the Americas. For more information, click here. The U.S. Commercial Service will lead a trade mission designed to develop business opportunities for U.S. exporters in Latin America. The program will include participation in a business forum in Santiago, Chile (September 7–9) and additional mission stops to conduct ​business-to-business ​meetings ​with ​firms ​in ​Argentina, ​Bolivia, ​Chile, ​Mexico, ​Peru, ​Paraguay ​and ​Uruguay. The business forum will include sessions on regional and industry-specific topics, as well as prearranged meetings with senior U.S. diplomats from 22 Western Hemisphere countries. The mission stops allow participants to meet with prescreened firms in the countries listed above. For more information, click here. As part of their Business Forum Series, the U.S. Commercial Service will hold a two-day conference on the international health care industry. The agenda includes insight from industry leaders and global updates on health care opportunities, regulation and best practices. Panel topics will include the medical device sector, diagnostics, health IT and global health. In addition, U.S. Commercial Service representatives from more than 20 countries will be available for one-on-one market consultations. For more information, click here. The International Trade Administration is organizing an executive-led trade mission for U.S. companies interested in learning more about the Turkish transportation market. Participants will travel to Ankara, Izmir and Istanbul to meet with government officials, potential business partners and end users to understand the growth opportunities in the $250 billion market. Trade mission delegates will also tour completed and ongoing transportation infrastructure projects. For more information, click here. The U.S. Commercial Service and the Illinois District Export Council will host a three-day conference focused on the development of more sustainable cities throughout the world. Participants will engage with trade experts, industry professionals and U.S. Commercial Service diplomats through panel presentations and executive meetings to learn more about the business opportunities and challenges as cities strive to become more sustainable. The conference will highlight modern infrastructure projects, green technologies, cybersecurity, disaster mitigation and a number of other critical components for cities striving to improve standards of living. For more information, click here.